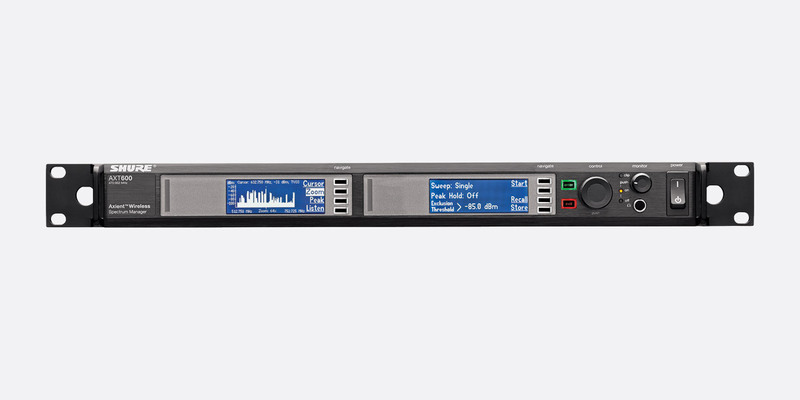 Shure Axient Digital professional digital wireless UHF systems have been designed to suit those who require reliable RF reception and clear audio. Application is suited to single or multi-channel use such as touring, broadcast, theatre, conferences or presentations. All receivers and transmitters share a wide bandwidth of 470 - 636Mhz which enables the Axient Digital series to be transported from location to location, re-tuning to country or area specific bands without the need for country specific hardware – something particularly useful for touring application. Redundancy is also a main feature of the Axient Digital series, whereby the operator can have the facility of redundant RF, Dante, audio output, or redundant power via an optional DC power module factory installed at time of order. The audio signal is converted from analogue to digital therefore no compression, EQ, or other processing is required in preparation to transmit the flat frequency response of 20Hz-20kHz, before two identical signals are transmitted on independent frequencies. The AD4D or AD4Q receiver can then switch between the two frequencies to retain the best signal and therefore the best audio quality. When switching between the two frequencies, the Axient system samples the last received data on the first frequency to ensure a seamless change. A standard transmission mode results in a transmitter to receiver analogue out latency of 2ms, whilst using the high-density mode will return a latency of 2.9ms. AES (Advanced Encryption Standard) 256-bit technology is also employed to ensure the transmission signal is secure. Axient Digital AD4D is a 1U rackmountable dual receiver that employs digital technology and true digital diversity to ensure high quality audio with a much reduced level of drop-out. Analogue audio output options include independent balanced 3-pin XLR with a dynamic range of over 120dB (A-Weighted, system gain +10), and a TRS jack output. Onboard digital outputs include Dante with a dynamic range of over 130dB (A-Weighted, system gain +10) and AES3 output is also as standard. The rear facing panel of the AD4D houses a locking AC main input socket and power output link socket to link the AC power to a second receiver. This link socket can be exchanged for an optional DC power input for redundancy at point of order (1). A user configurable 4-port Dante switch that can be used for control and audio, or separate streams with redundancy is situated to the left word clock I/O. A single AES3 output allows the digital output of channels one and two audio, whilst each channel also has a dedicated 3-pin XLR output as well as TRS 6.3mm jack output. Line/mic and ground lift switches enable to the operator to adjust for best output. On the far right there are four BNC connectors. Channels A and B can be connected to antenna for RF reception whilst channels C and D can be used to cascade the RF reception to additional receivers. The front facing side of the Axient AD4D receiver features a 6.3mm headphone jack output that enables Dante Cue and Dante Browse monitoring, as well as a rotary headphone volume controller. Both channels one and two have six stage LED meter for RF channel A and B, and blue LED indicators of the functionality of both channel A and B. An eight stage LED meter allows the user to quickly monitor the audio level being received. A large display screen enables the user to see a host of performance feedback including a ‘channel quality’ meter, channel gain, transmitter battery life, channel and frequency. There are four function keys to the right of the screen that give quick access to the intuitive menu shown on the screen whilst a large rotary control know and enter/exit buttons also help navigate the user definable settings available. A rocking and latching power switch is positioned to the far right of the front panel. Rack mount fittings are not removable. Note: (1) optional redundant power option must be requested at time of order and may incur additional lead time. IEC mains power link is standard. AD4DUK – includes accessory pack with IEC power cable, manual, 1x network cable, 2x BNC cables, 2x BNC bulkhead adapter, 2x twig antenna. AD4Q receiver has all the same functionality as the AD4D receiver however it has four channels of reception. The receiver can be linked to two antenna for normal operation, or four antenna for ‘Quadversity’ mode whereby four remote antenna can be connected for optimum reception and much reduced drop out. This is particularly useful for operation within stadia or theatre where line of sight isn’t applicable, but also effective for multi-room broadcast operating from a central control hub such as hotel presentation rooms or houses of worship. When running in ‘Quadversity’ mode, the BNC connectors usually used for cascading are instead used for the two additional remote antenna. Each channel has a dedicated balanced 3-pin XLR output and 6.3mm TRS jack output, however if using AES3 outputs for channels 1 and 2, channel 3 XLR output is utilised therefore the TRS jack output can be used for analogue output. Likewise, channel 4’s XLR output is utilised for channels 3 and 4 AES3 output so analogue output will be via TRS jack output. With the exception of two additional channels of monitoring, the front facing panel is the same as the AD4D. AD4QUK – includes accessory pack with IEC power cable, manual, 1x network cable, 2x BNC cables, 2x BNC bulkhead adapter, 2x twig antenna. 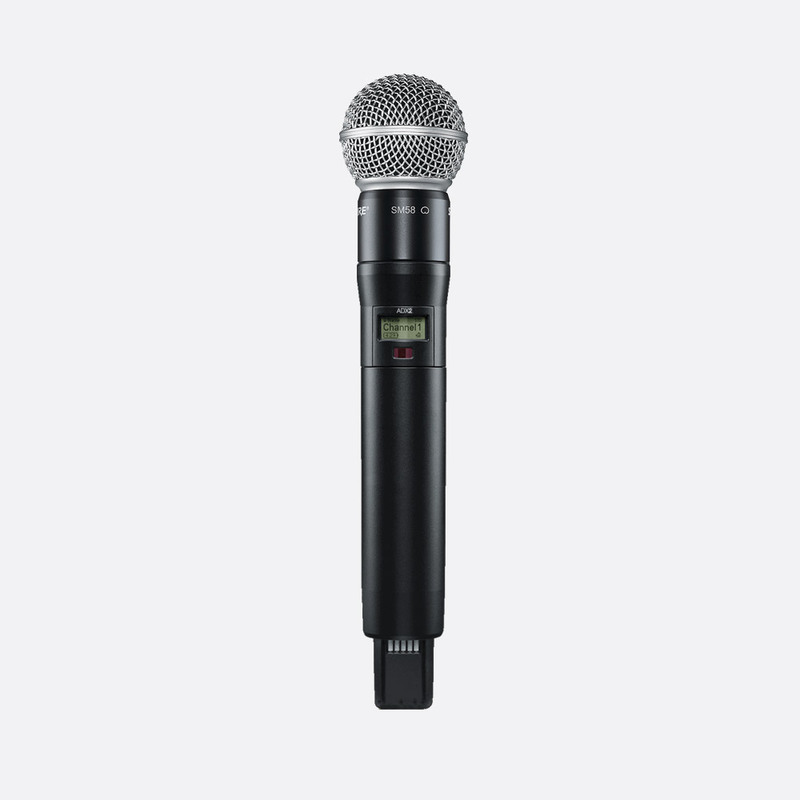 ADX2 handheld transmitter offers interchangeable mic capsules including SM58, BETA58a, KSM8 nickel or black, KSM9 nickel or black, KMS9HS nickel or black, BETA87a, BETA87c, and VP68. Can transmit a frequency range of 20Hz to 20kHz with flat response, however each mic capsule offers a different frequency response curve. Up to 9 hours of operation can be achieved using a single SB920 battery. Offers external charging contacts for docked charging with optional SBC240 or SBC840 charger dock. Like the ADX1, the ADX2 offers AES 256-bit encryption for signal privacy. Backlit LCD screen displays group/channel, frequency, or battery life, while frequency and power lockout functions are accessible by navigating the user menu. A low profile lockable power switch is positioned on antenna section of the microphone. ADX2 transmitters can controlled remotely for real-time control over parameters without physical access to the transmitter. This enables the system to operate ‘interference avoidance’ whereby the transmitter will detect interference, switching automatically if the active carrier frequency degrades. Note: for ADX remote control the Shure AD610 and AXT600 are required as additional components. Shure microphone clamps are supplied as standard with a 5/8 inch thread. 5/8 inch to 3/8 inch adapters are available separately (stock code 53-217). As the ADX2 however the ADX2FD utilises frequency diversity and has been designed for ‘the most critical performances’. Two independent transmitters are enclosed in the transmitter to add an additional level of redundancy. 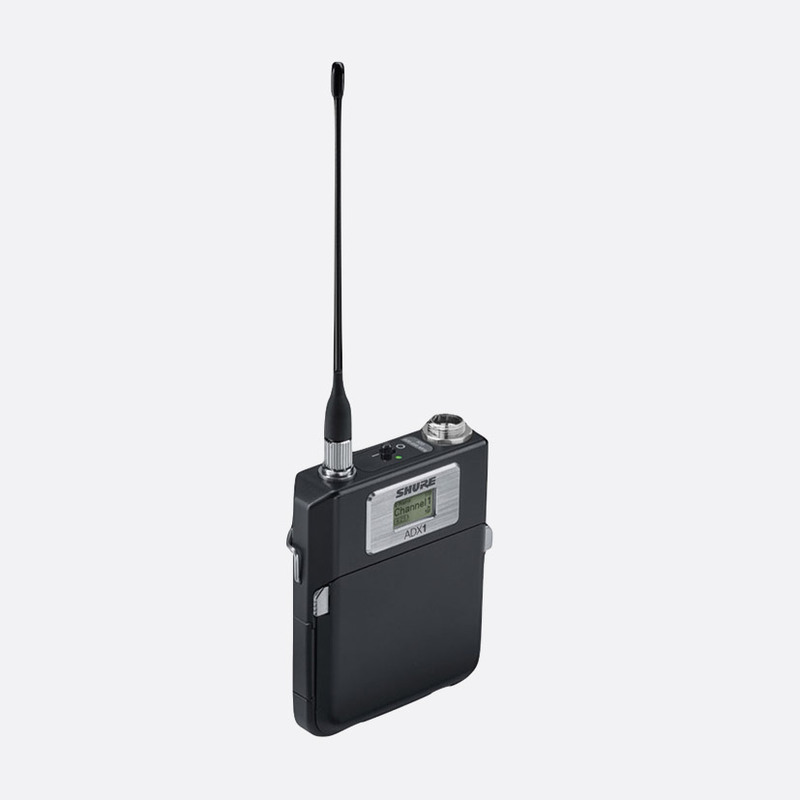 The magnesium alloy manufactured ADX1 belt pack transmitter has many of the features the ADX2 handheld transmitters offer, however has a detachable quarter wave antenna and either 4-pin TA4 or LEMO3 input connector for compatible microphones. Offers external charging contacts for docking and charging with optional SBC240 or SBC840 battery charger. Remote control is available for the ADX1 however a Shure AD610 and AXT600 are required as additional components. ADX1 is shipped including 2x SB910 batteries. Manufactured from Ultem PEI for heat resistance and durability, the ADX1M is Shure’s smallest bodypack transmitter. With dimensions of 68 x 60 x 18mm, the ADX1M can be used with detachable belt clip or concealed on the user on in clothing. To aid the compact nature of the transmitter, an internally mounted aerial replaces a typical external twig style antenna. An OLED display shows information including channel, batter life expectancy, signal strength, and name. Due to the small dimensions only LEMO 3 connection is available, but is recessed to retain compact dimensions when in use. User buttons, located on the top edge of the transmitter are manufactured from a ‘membrane-style’ material to add protection against sweat and water ingress. 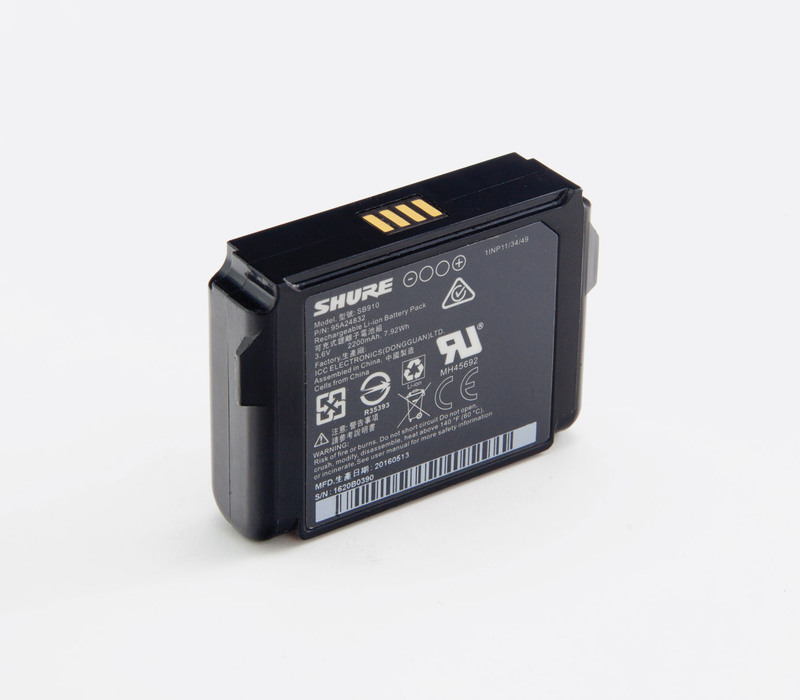 Up to 7 hours of run time with a single SB910M rechargeable battery. Offers external charging contacts for docking and charging with optional SBC840M-UK charger dock. 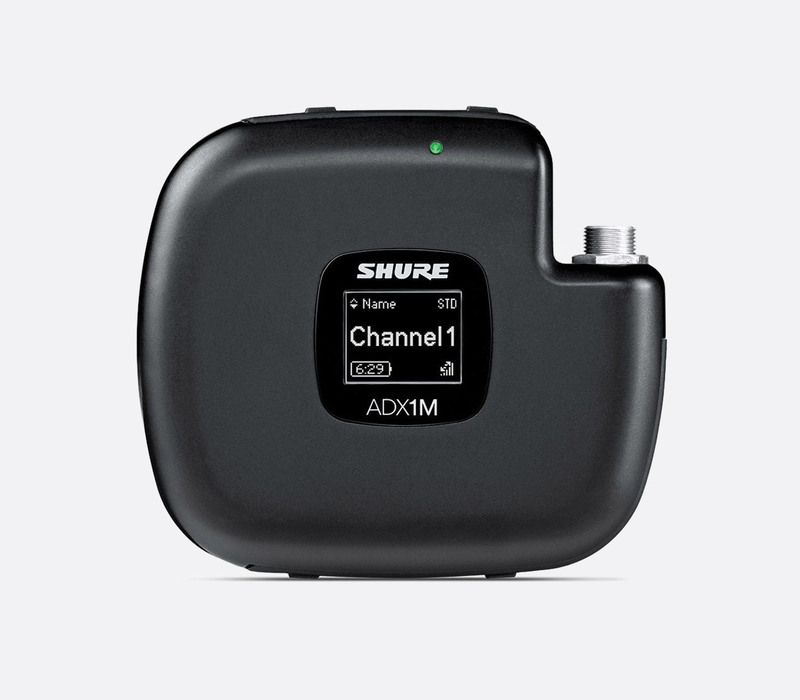 ADX1M can be controlled remotely however to achieve this a Shure AD610 and AXT600 are required as additional components. ADX1M is shipped including 2x SB910M batteries. 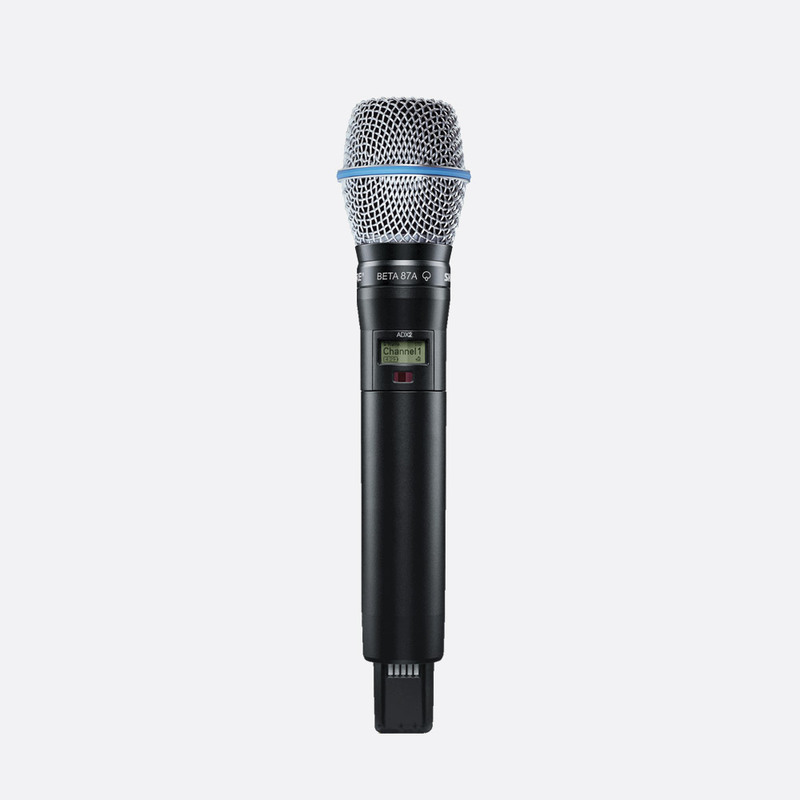 Shure AD610 provides a wireless network connection of up to 24x ADX transmitter per access point, and Axient Digital receivers, and is required for remote control of ADX transmitters. Via 2.4GHz link, AD610 enables the technician to remotely adjust gain, change frequencies, mute signals amongst other functions. Automatic scan function ensure the best 2.4GHz is used for this connection, which can be stored in Wireless Workbench software for future analysis. Included accessories: WA371 microphone clip for stand mounting, 25ft Ethernet cable, thread adaptor, and PSU. This spectrum analyser works alongside the AD610-UK to scan UHF frequencies of 470-952MHz within 64 seconds and deploy the compatible frequencies to linked Axient Digital receivers. Backup frequencies are also logged in a ‘live’ list, ready to be deployed automatically if the Axient receiver detect interference. A listen feature ‘demodulates FM signals’ to enable monitoring via headphones. When linked to Shure’s Wireless Workbench, a ‘rich graphical interface’ can be viewed by the operator for better analysis and control. The front facing panel of the 1U rackmount unit features two displays – the left to show the spectrum plot, monitoring status and signal strength; and the right to show menus and settings. Each screen has four associated cursor buttons for navigation and selection. ‘Enter’ and ‘Exit’ buttons are located to the right of the screens with a rotary/push control to aid navigation. LEDs show the current Monitor clip, Monitor output status, with a 6.35mm balanced jack headphone socket and monitor volume control for headphone monitoring. A latching, ‘rocker’ power switch is on the far right hand side. The rear of the AXT600 features all I/O connectivity including IEC 100-240V AC power input, IEC cascade output, primary AC power switch, 2x Ethernet ports for network connectivity, 2x unbalanced, active 50ohm BNC connectors for antenna input, and 2x unbalanced 50ohm BNC connectors for RF cascade. Price on application, please call us.